2) Select a dry spot, you may need to use a piece of wood or bark to start your tinder on, to keep it off a wet surface. 4) Allow enough air flow to start the fire. 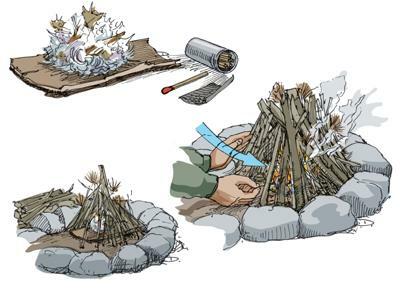 5) Add kindling and fuel slowly as the blaze gets moving. I have built fires in all types of weather, while camping or for practice. A fire will keep you warm, allows you to cook food and or purify water, adds light and a sense of security to your camp. So my lesson here to you is learn this basic skill, with several types of ignition sources – blast match, old fashion flint and steel, steel wool and battery, bow drill etc. lots of improvised ways to start a fire and they are all handy to know and be able to utilize. This entry was posted in Uncategorized and tagged Survival Skills on August 16, 2015 by admin.